The Daedric artifact Saviour's Hide is armor obtained as a reward for completing Hircine's Daedric Quest. See the books Tamrielic Lore and Tal Marog Ker's Researches for background on this item (although some details are different, since these books were initially written for Morrowind). In the US version of the game, the name of this item as shown in your inventory is "Saviour's Hide" (with a "u"), which has therefore been adopted as its official spelling (see the UESP spelling guide). 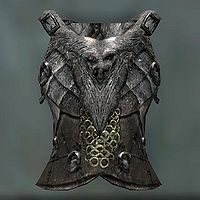 However, every other reference to this item in the game uses the spelling "Savior's Hide" (without a "u"), as did earlier Elder Scrolls games (e.g., Cuirass of the Savior's Hide). Also, some international versions of the game have apparently changed the spelling to "Savior's Hide".